Durham Remaps is one of the leading engine tuning / remapping specialists in the North East. With years of experience and a passion for staying up to date with the latest technology they have became one of the most well respected and trusted companies within their sector in the region. 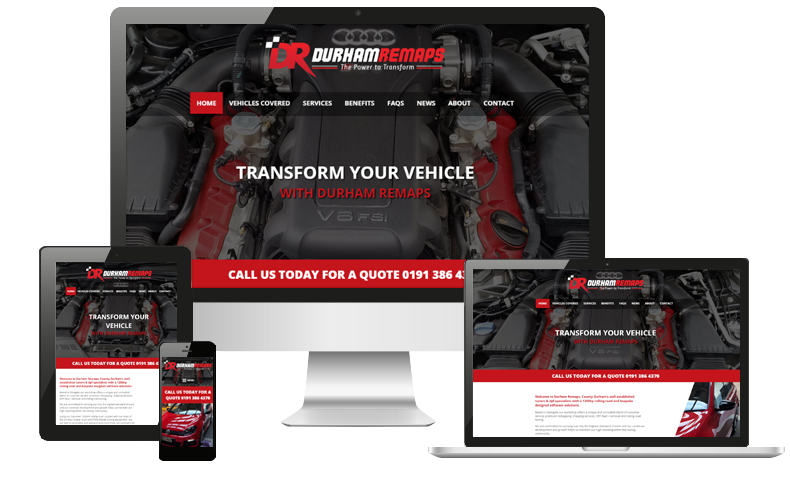 Having worked on the rebranding of Durham Remaps in the past, they approached us to redesign their website as they felt they had outgrown their existing site. The key requirement for this redevelopment was to create a site that was flexible and would allow for it to grow alongside the business. With there is a lot of competition within their industry it was important for the site to have instant impact and showcase all of their services in a way that engaged the visitors to the site. After reviewing their existing site and analytical data it became clear that the majority of their visitors were viewing the site on mobile and tablet devices, which meant we needed to create a site that was responsive to allow for the best user experience no matter the device that was used. We built the website using WordPress which allowed for Durham Remaps to update their site with their latest work, also because they were active on social media we linked their news section to Facebook, Twitter and Google Plus which allowed any news items to automatically post to their social networks to push users to their website.